The Tech 10 has set the standard for Motocross boot performance and protection for well over a decade and for summer the completely redesigned Tech 10 boot raises the performance envelope even further.Perfection through innovation; while maintaining the iconic Tech 10 look, the new boot represents an entirely new approach - improving its ability to give a rider the ultimate in feel, comfort and safety. 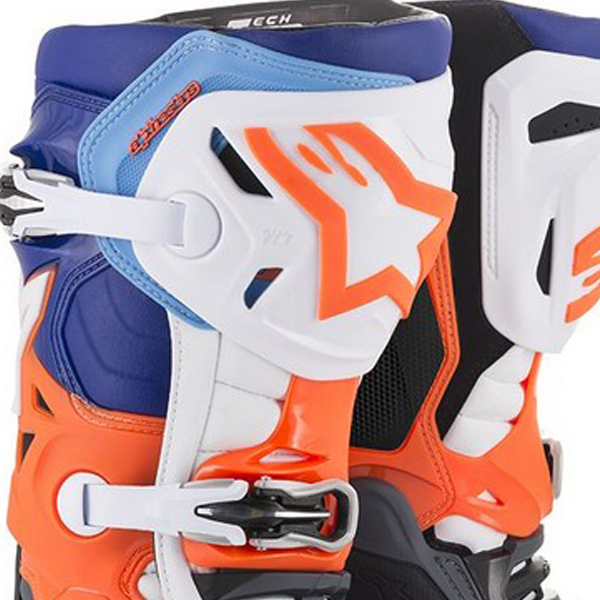 The Tech 10’s re-design has been guided by three priorities as the Alpinestars technical footwear development team looked to improve overall functionality, performance and safety, decrease weight and reduce material volume. Maximizing these priorities is the key achievement of the new Tech 10 and the result is an all new boot with a greater range of movement and flexibility while offering better control over the flexion and torsion forces that significantly improve boot performance, giving the rider greater confidence and protection. One of the breakthrough innovations for the new Tech 10 is the introduction of a patented Frontal Flexion Frame. The Frontal Flexion frame combines with the Rear felxion frame to perform as complete Flexion Control System. 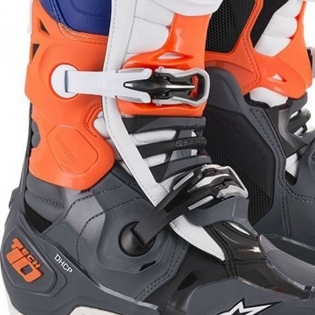 This unique System includes a connector on the front of the boot which unites the lower buckle with the upper blade, buckle and shine plate. This Connector is engineered to float freely between the lower buckle and the shine plate, controlling frontal and back flexion by progressivelyabsorbing and distributing force across the boot frame. 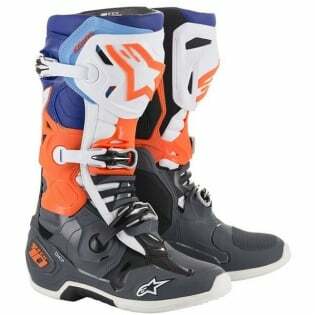 This helps maximise a rider's flexion control and overall boot protection and performance. Exlcusive to the Tech 10, the new foot shell is a slim single piece foot chassis with an even streamlined shape and profile. This new foot chassis is injected with 5 uniquely engineered densities in different parts for controlled flexibility, maximum support where needed and impact protection. The redefined multi-injected foot chassis avoids multiple layers of material assembly, dramatically reducing weight and improving performance. Constructed as one single-piece - without stiching or glued parts that come a part with wear and tear, this unique foot chassis is extremely durable. The new Tech 10 includes a new conceptualized Internal Ankle Brace. Combining the new design of the medial and lateral torsion arms (made of fiberglass-reinforced material), and with the inner brace's double pivot system, the boot retains it's shape during flexion. These arms are a more compact lighter and eddicient design and offer greater motion with the outer shell (both vertically and laterally), and provide added protection against ankle and heel impacts. This updated ankle brace protects against movements the ankle shouldn't bend in, while still providing excellent freedom of movement in its natural direction and avoiding excess stress to the knee. These changes allowed us to reduce the weight, streamline the profile and decrease the material volume of the ankle brace. Not available on any other boot. The new Tech 10 has integrated into the foot chassis, the new DHCP (Dynamic Heel Compression Protector) a patented collapsible FOAM (PolyUrethane) shock absorber for high-energy impact events. The DCHP has been developed and tested during full seasons of Supercoss and Motocross Championships. The DHCP is an impact protection system designed to significantly reduce the effects of excessive, potentially injury-causing, energy being transferred directly to the heel bone, for example in case of ejecting from the bike and landing standing up, where the heels take most of the impact and are at risk of injury. 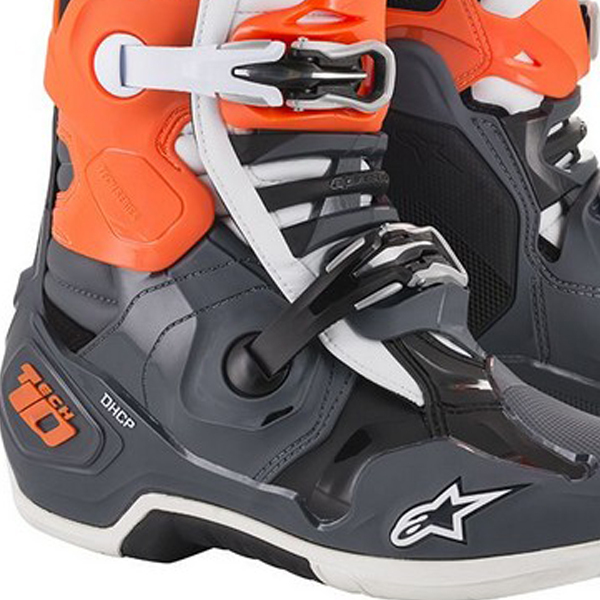 A breakthrough innovation for the Tech 10 is the introduction of Alpinestars patented Frontal Flex Frame. Combining with the dual front and rear blade connectors, the Frontal Flex Frame gives the Tech 10 a complete and seamless flexion control system, from the foot shell all the way up to the shin plate, offering high performance double motion control, preventing over-compression and hyper-extension. Engineered frontal flexion control offered by a dual-density TPU connector system, uniting the lower buckle plate with the upper blade connector, buckle and shin protector. Engineered to ‘float’ freely between the lower and upper boot construction, the Frontal Flex Frame acts as a shock absorber by distributing energy across the boot frame while controlling forward and rearward flex, progressively releasing force which dampens and absorbs impact energies. Asymmetrical, dual pivot arms on boot frame. Dual compound removable anatomic footbed includes EVA for comfort and support and aids even weight distribution. Asymmetrical medial and lateral double pivot system for improved levels of flexibility and precision for both independent and synchronized movement. The medial pivot arm’s higher placement reduces material volume in the lower part of the boot, creating more space for the patented inner ankle brace system to have free movement and improve control. Reducing the volume on the inner side also reduces abrasion, where the boot is in contact with the bike and improves grip and feel. Redesigned dual density TPU rear blade system engineered to prevent hyperextension while offering improved flex control and impact resistance. Built into the Tech 10’s unique and lightweight single-piece co-injected foot chassis is the patented Dynamic Heel Compression Protector (DHCP), an innovative safety feature which includes a fully integrated collapsible heel area with expanded poly-foam to absorb high impact energies during a crash. DCHP features a directional impact protection system which significantly reduces the effect of excessive, potentially injury-causing energy being transferred to the ankle and lower leg. DHCP has been developed and tested in the demanding circuits of professional Supercross and Motocross. The Tech 10 design is slimmer and more streamlined with a contoured calf protector ergonomically wrapping around the rear leg. Exclusive dual compound sole is seamlessly integrated to the multi-density foot base structure with built-in support. The Tech 10 chassis combines advanced lightweight microfiber and impact and abrasion resistant TPU shell. Poly-fabric lining with 3D open cell foam incorporates anti-slip suede in heel area, keeping the foot located inside the boot. One the Tech 10’s defining features is the redesigned biomechanical inner ankle brace. Lighter, anatomically redesigned medial and lateral torsion arms which are compact and offer increased range of movement and control. In conjunction with the outer boot chassis, the ankle brace gives vertical and lateral protection from ankle and leg compression and rotation and progressive damping of torsional forces during an accident, while still allowing natural freedom of movement. Double pivot system allows the Tech 10 to retain its integrity while flexing which removes the need for alternative torsion bars for varying ankle widths and crucially gives the essential progressive resistance to rotational and vertical forces which, otherwise, are so damaging to ankles, knees, upper legs and pelvis if not arrested in a controlled way. New low-profile, pull-on design for reduce material build, less weight and to facilitate easier and quicker wearing. Innovative flexion inserts work seamlessly with new Tech 10’s flex support system for ultimate in performance. TPU protection and shock absorbing padding on the heel and ankles and an ultra-thin and flexible forefoot area for increased sensitivity and control.